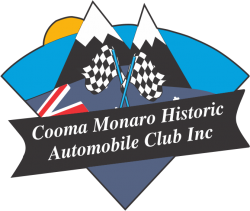 Previously known as the Classic and Historical Automobile Club of Monaro Region, the “Cooma Car Club” was officially incorporated as The Cooma Monaro Historic Automobile Club Inc (a non-profit organization) on 8 March 2002. The club was formed with the principal objective of bringing together persons with a common interest to encourage the use, maintenance and presentation of motor vehicles without prejudice to make, model, method of manufacture or country, and other vehicles of interest that are at least 30 years old. The principal is strongly observed today.